Senior Girl ~ Volleyball player, Elisabeth Lohi, played strongly at both our home game against Central Kings and at pre-regionals the following day. As a setter, she hustled across the court and made many great saves to keep the ball in play. Her short serves challenged the opposing teams and kept them on their feet. She even had the chance to spike a few balls which helped earn points for the team! Her enthusiasm and dedication to volleyball was clearly demonstrated last week and she is well deserving of recognition for her hard work. Well done, Elisabeth! Senior Boy ~ Hockey player, Ryan Costello (our captain), worked tirelessly on and off the ice at the Northeast Hockey Showcase in Tilton, New Hampshire. He was instrumental in leading the players in a positive way every minute of the weekend. Ryan patted guys on the back when needed and contributed with three goals in an effort that saw us lose in overtime of the semi-final of the tournament. Ryan knows how much solid leadership is needed on a young team. He continually works on improving his game on and off the ice and will be counted on heavily throughout the remainder of the season. Well done, Ryan! Junior Boy ~ Hockey player, Zach Logan, was an athletic and intuitive goalie at the Armbrae Tournament. He anchored the defense, making several big saves at key points in the game. All the teams were very equal at the tournament, but we simply had a better goalie. This made the key difference that led to a Gold Medal. Great job, Zach! Junior Girl ~ Hockey player, Sarah Hardy (Consistency is Sarah’s middle name! ), is a hardworking defense turned forward who has been a consistent force for our Girls’ Hockey team this season. Often creating opportunities for her line mates and covering as the high forward, stopping the other team from ever leaving their zone. To top things off, Sarah scored a beautiful, top-shelf goal vs Northwood this weekend to put us on the board and tie things up against the 2nd best team in the league. Congrats, Sarah! Senior Girl ~ Hockey player, Maddy Walsh (Co-Captain this year), is a 200 foot player doing it all for our team. Maddy is one of the toughest defense to get by 1-on-1 in the league and her impressive puck skills make her equally as dangerous offensively. Maddy had two goals and two assists in four games this weekend in New York including an unassisted bar-down beauty and a helper in our only goal vs Trinity College School (TCS) with only a minute left to play for the win! Congrats, Maddy! Senior Boy ~ Biathlon member, Linus Mulherin, was on fire at the zone’s run and shoot! After a successful zero in a competitive field of 60 male biathletes, Linus sprinted his laps with a run time of 14.26 and, through rhythm and control of breath, he shot clean -- 10 for 10. It was a very successful race for Linus which will give West Nova "a run for their money" next weekend. Excellent finish, Linus. 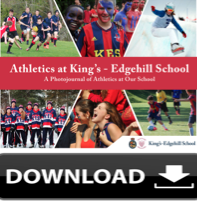 Athletics is one of the four pillars of a King's-Edgehill education. Sports are mandatory at every age and part of the day's schedule. With that much time devoted to physical activity, it's a good thing we have so many choices! Have a look at all the sports your child can try at KES: Download the Athletics Photojournal.